You want to #resist? Helping refugees means helping refugees, you know, talk the talk not just walk the walk. And not just on weekends. Here’s some of what you can do. The American refugee acceptance, qualification, and resettlement process is a tangle of the United Nations, at least three different agencies of the U.S. government, and multiple nongovernmental organizations. You can’t speak to others, advocate, interact emphatically with refugees, or decide where to devote your volunteer time or money without understanding how this works. Start here. As for advocacy, ask why your state does not resettle more refugees. While states are not allowed to turn away refugees who wish to live there, 30 American governors said they’d refuse to accept Syrian refugees into their states if they somehow could. Just ten states resettled more than half of recent refugees to U.S. Arkansas, the District of Columbia and Wyoming resettled fewer than ten refugees each, while two states – Delaware and Hawaii – took in none. A significant issue is that people are afraid. Understand the vetting process so you can talk to them. Explain how this process has been in place for a long period of time. Marches and demonstrations are never a bad thing, but to affect real change you must reach out to people who disagree with you. Look for opportunities to talk to groups that are not on your side. Strongly consider fact-based arguments and not emotional appeals. There is an extraordinary amount of inaccurate information out there, from purposeful hate and fear mongering, to well-meaning people making dumb mistakes. Everyone’s heard the poem on the side of the Statue of Liberty; try another path to persuade people. For example, for those concerned about the cost to taxpayers, after no more than 180 days, financial assistance from federal agencies stops and refugees are expected to become self-sufficient. See if your local schools will allow refugees to speak about their home country. People are less fearful and more accepting of those they know better. You can say you hate Syrians; it’s harder to say you hate Mrs. Aswad who spoke to your son’s social studies class. Once a refugee arrives in the United States, a process called resettlement begins. In the U.S., the International Organization for Migration and U.S. Office of Refugee Resettlement work with voluntary agencies like the International Rescue Committee, Church World Service and others to resettle refugees. These voluntary agencies have offices across the country. For example, Church World Service has resettlement programs in 21 states, while the International Rescue Committee has programs in 15. From there, local nonprofit ethnic associations and church-based groups help refugees learn English and job skills. All of these nonprofits need volunteers. Here’s a list to get you started. Here are some examples of what volunteers do. It could be something as simple as helping kids register for school. Some organizations may offer, or be willing to start offering, internships for students to bring in more help. Check if your school is willing to offer credit. If you or your organization can offer refugees a job, contact a local resettlement group. Consider canvassing businesses to see if any of their employment needs can be filled by a refugee. Refugees bring a variety of skills with them. Speak with local resettlement groups and see if you can offer “matchmaking” assistance. Check with colleges and universities about available scholarships, or free classes. For persons who cannot work, consider volunteer activities to help them build skills or a resume. Support businesses that employ refugees, and stay away from ones who explicitly do not. If you shop at businesses that employ a lot of refugees or immigrants who work primarily for tips (The people who deliver food to you? Drive your Uber? ), tip generously. You can literally put money into the hand of someone who can use it. Despite the lofty and idealized rhetoric surrounding refugee admissions, the United States is quite stingy in the number of people it accepts. Knowing history makes you a more credible speaker and educator. America sets an annual ceiling on refugees; for FY 2016 it was 85,000. Refugee number 85,001, no matter how desperate, waits until next year. Go back to 2006, and the ceiling was 70,000 (though less than 50,000 were actually admitted). Since 1980, the United States has accepted fewer than two million refugees overall, and 40 percent of those were children who accompanied or joined their refugee parent(s). By contrast, though not limited to refugees, the Obama administration deported 2.5 million people in just eight years. The FY2016 American quota for Syrian refugees was 10,000. In contrast, among Syrians alone, Canada in 2016 took in 25,000. Germany admitted 300,000 refugees from various nations in 2016, following close to one million in 2015. Careful about being an amateur lawyer; preserve your credibility. 8 U.S.C. 1152 Sec. 202(a)(1)(A) makes it unlawful to ban immigrants (Legal Permanent Residents, green card holders) because of “nationality, place of birth, or place of residence.” The law however is silent on banning refugees for those same reasons. Inclusion of links does not imply endorsement. Exclusion of any organization implies nothing negative. Do your own research before making any donations or volunteering in any way. Here’s a NYT article that goes out of its way trying to tie the lack of Afghan Special Immigrant Visas (SIVs; for former U.S. military translators) to the Trump travel ban executive order. The two are not related, and it would have taken the New York Times exactly one Google worth of journalism, or even reading elsewhere on their own website, to understand that instead of publishing a misleading piece. For a newspaper claiming its work stands between us and fake news, this is just sad. — Afghans who worked for the American military and government are being told that they cannot apply for special visas to the United States, even though Afghanistan is not among the countries listed in President Trump’s new travel ban. — It was unclear if the visa suspension was related to the president’s new ban. — It is unclear whether the reported suspension of new applications was related to the number of available visas or to the president’s order reducing refugee intake generally, or to a combination of the two factors. — Afghanistan was not included in either of the president’s travel bans, but his decision to reduce the overall number of refugees accepted by the United States would affect Afghans as well. To be clear, the Trump travel ban and visas for Afghan translators have absolutely no connection. None. Afghanistan is not included in Trump’s travel ban at all. Afghans translators are not refugees under the law. Like its now-defunct sister program for Iraqi translators, the Special Immigrant Visa Program (SIV) was set up to provide immigrant visas (Green Cards) to Afghans who helped U.S. forces. Congress, not the president, sets numerical limits on how many of these visas are to be made available each year. When the limit is reached, the program goes on hiatus until next year. Congress is free at any time to expand the number of these visas available. That’s it. Now, how could the Times have uncovered these facts? Journalism. The Times could have Googled Afghan Special Immigrant Visas. That would have shown them a State Department page explaining things. The Times could have contacted any number of advocacy groups that also have online explainers about all this. Most competent immigration lawyers would know, too. The Times could have looked at its own archives from 2011. Or, the Times reporters on this story could have read their own website. Because elsewhere in the Times was reprinted a Reuters story that pretty much accurately explains the problem. That’s it, that’s really all that was necessary to publish an accurate story. But that accurate story would not have included the attempts to link the Afghan problem to Trump, which is the takeaway rocketing around the web. And for the haters, my own article here is not “pro-Trump.” The reason? Because the Afghan story has nothing to do with Trump. For those who say “This is not who we are,” well, look again. It all seems to be exactly who we are and have been. President Donald Trump’s executive order banning travelers, immigrants and refugees from seven predominantly Muslim countries is only the latest twist of dark threads that have always been present in America and its immigration policy. The executive order is not unprecedented. It is evolutionary, predictable, nearly an inevitable step. Begin with the targeted countries, Iran, Iraq, Libya, Somalia, Sudan, Syria, and Yemen. America has bombed or used drones and special forces in six of them, and attacked the seventh with cyberwar. The Muslims there have suffered far in excess of a travel ban at the hands of America. Indeed, many of the refugees leaving those nations became refugees as a result of American war-making, often under the guise (Libya, Iraq, Syria) of “protecting” those people from an evil dictator, some Sunday morning talk show version of genocide, or a red line few outside the White House could see. The countries in Trump’s executive order have long been singled out for special treatment under American immigration law. Though Trump in his crude style talks about “extreme vetting,” such a process has been in place since the George W. Bush administration, continued under Obama, and is operating today. It has a nicer, if somewhat Orwellian name, “administrative processing.” On the list of nation affected: Iran, Iraq, Libya, Somalia, Sudan, Syria, and Yemen. People from these nations, and a few others, go through an alternate visa processing procedure that delays their travel. The process involves various intelligence agencies vetting the traveler. Some applications are left to pend indefinitely, a de facto travel ban. The seven nations also were a part of the Bush-era Muslim registry, known as NSEERS. Trump’s seven nations also appear on an Obama-era list. That list, the equally Orwellian-named Visa Waiver Program Improvement and Terrorist Travel Prevention Act, disallows use of America’s visa-free travel program to persons who even once visited the targeted nations. So, for example, a British citizen otherwise eligible to enter the United States without a visa must instead appear for questioning at an American embassy abroad if she, for any reason, even as a journalist, stepped foot in Iran. That nations long-held to sponsor terrorism such as Saudi Arabia and Pakistan are not on Trump’s list is not surprising. They haven’t appeared on most of Bush’s or Obama’s lists either. Following Trump’s directives aimed at refugees it quickly became almost mandatory for celebrities and pundits to come up with a personal story or two about their family’s immigrant ties, and preach a bit about the Statue of Liberty and freedom. Left unsaid was that the number of refugees admitted to the United States is small compared to many other nations. The U.S. admitted a record number of Muslim refugees in 2016, some 38,901 of the nearly “>85,000 total refugees allowed into the U.S. Go back to 2006, and the total number of refugees admitted drops to under 50,000. Though there have been refugee “surges” into the United States such as Holocaust survivors following World War II (650,000 people) and the Vietnamese “boat people” (100,000) after the end of that war, Americans historically feared refugees, not welcomed them. Since 1980, the United States has accepted less than two million refugees overall, and 40 percent of those were children accompanying their refugee parent(s). The U.S. sets an annual ceiling on refugees admitted, currently 85,000. Refugee number 85,001, no matter how desperate her case, must wait until the next year. In contrast, among Syrians alone, Canada in 2016 took in about twice as many refugees as the United States. 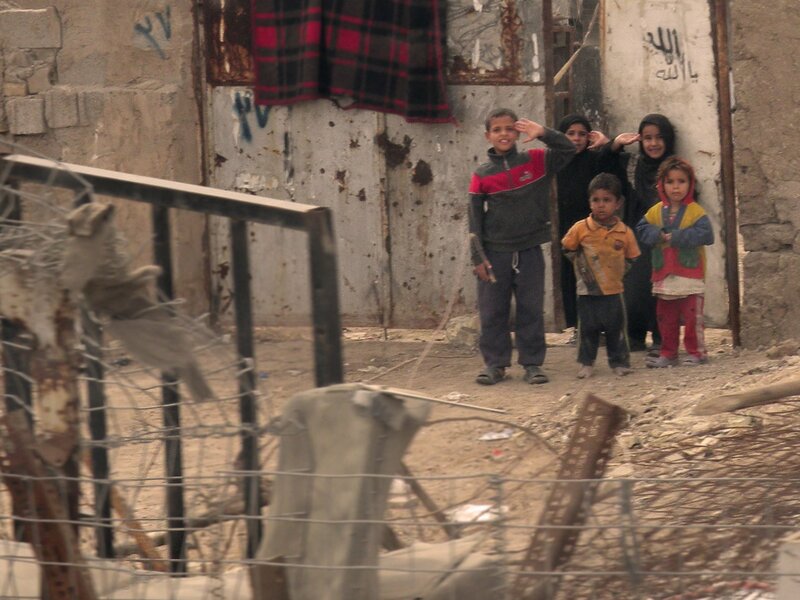 Some 25 percent of the entire population of Lebanon are refugees. Germany expects to admit 300,000 refugees from various nations in 2016, following close to one million in 2015. Following the 1965 Immigration and Naturalization Act, 8 U.S.C. 1152 Sec. 202(a)(1)(A) makes it unlawful to ban immigrants (i.e., Legal Permanent Residents, Green card holders) because of “nationality, place of birth, or place of residence.” The law however allows banning nonimmigrants such as tourists or students, as well as refugees, for almost any reason. Challenges to this are near-impossible. American courts have consistently upheld that they cannot exercise judicial reviewability over visa decisions made abroad in the specific, and more broadly, generally do not extend the protections of American law to foreigners outside the U.S. The Supreme Court has also long-acknowledged immigration law’s “plenary power” doctrine, which generally immunizes from judicial review the substantive immigration decisions of Congress and the executive branch. And even though legal immigrants are not banned by nationality or place of birth per se, restrictions on the number of legal immigrants from certain nations are limited to the point of near-virtual bans. For example, the restrictions are such that some Filipino and Mexican relatives of American citizens face a 24 year wait (another Orwellian term, “priority date”) for a Green card. It is not uncommon for applicants to pass away before their turn comes. However, the most evolutionary aspect of Trump’s executive action on immigration, and the inevitable hardening and expansion of such positions, is the underlying driver of it all: fear. The government of the United States, from September 12, 2001 through the present day, has constantly fanned the flames of fear of terrorism. 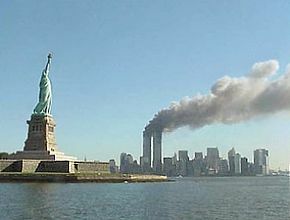 Despite the well-known statistics of how an American here at home has a greater chance of being struck by lightning than dying in a terror act, that following 9/11 only a handful of Americans have fallen victim to acts of terror inside the United States, and despite the fact that few of any terror attacks inside the Homeland were committed by the poster child of fear, the foreign terrorist who infiltrates the U.S. specifically to do harm, Americans remain terrified. For over 15 years, three presidents have used fear (they called it security) as a justification for, well, nearly everything. And Americans bought the line nearly every time. Fear of the smoking gun being a mushroom cloud. Fear of terrorists slipping through the net justifying NSA spying on Americans. Fear of more terrorism justifying torture, drone attacks, leaving Guantanamo open, militarizing Africa, having us take our shoes off at the airport, not being able to bring a bottle of water on a plane, no longer being able to enter a growing range of buildings without some sort of security check and bag search, background checks, showing ID, and the No-Fly list. 30 American governors said they’d refuse to accept Syrian refugees into their states if they could. Trump’s use of executive orders to accomplish his immigration goals is also nothing new. Both Bush and Obama did the same. In fact, Franklin Roosevelt used an executive order to establish the World War II Japanese internment camps. Of course nothing Trump has done or has proposed regarding immigration will realistically make America safer. That is true, and it is irrelevant. Like much of the security theatre that has become normalized post-9/11, safety is not the point. Keeping fear alive and maintaining the politically-driven myth that government is on the job protecting the Homeland is what matters. Trump knows this, as did Obama and Bush. The ugly truth is despite the airport protests, a large number of Americans remain afraid of foreigners and want what Trump did. The ugly truth is there is unfortunately nothing here unique to the Trump era. BONUS: Those who focused last weekend on the two Iraqis who translated for the American military in Iraq at great risk to their lives and were detained at a New York airport may wish to read about the decades-long struggle of translators from Iraq and Afghanistan to escape those nations for fear of their lives, and the poor treatment they have received at the hands of now three administrations. Syria passed a grim milestone this week. The country now has more displaced people/refugees without homes than people still living in their homes. The only significant response to this humanitarian crisis, a slow motion genocide, from the West has been more war, both from foreign aircraft and special forces directly, and via more support for the militias on the ground. 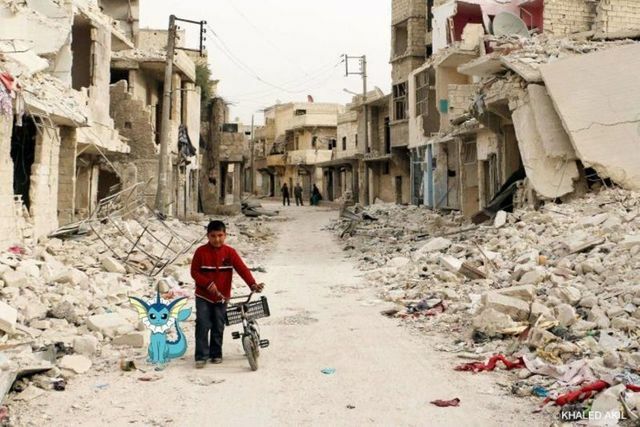 The Syrian people are treated as simply part of the landscape being fought over. Destroying them seems as consequential as blowing up the buildings they used to live in. That serves as background — literally — to the striking Pokemon Go images (above) created by Syrian artist Khaled Akil and others. They are trying to use the international frenzy over the game to keep attention on the plight of their people. 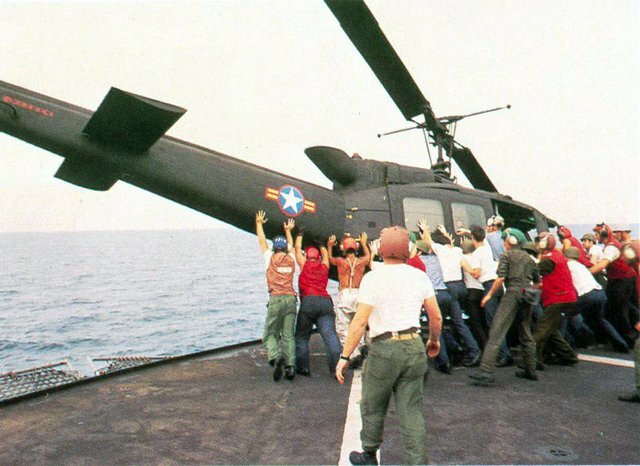 Here, they say, is what politicians’ claims to “destroy ISIS!” really mean. Another artist, Syrian Saif Aldeen Tahhan, posted showing Pokemon Go players holding smartphones and seeking not Pokemons but medical care, school books, or undamaged homes. One image depicts a smartphone in front of a rubber dinghy of refugees at sea, with the user trying to capture a life ring. 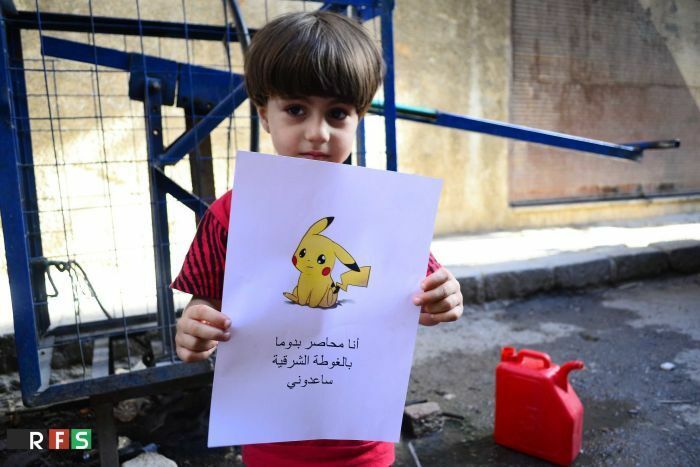 “I am in Kafr Nabal in Idlib province, come and save me,” reads text underneath a Pikachu on a poster held by a young boy. If ever tragedy descended into sick comedy, here it is: Obama plans on solving the massive humanitarian refugee crisis in the Middle East via a Kickstarter campaign. I’m not kidding, though one can easily see the headline above on an Onion story. The U.S. government’s war in Iraq and Syria has already cost American taxpayers between $780 and $930 million, and could amount to over one billion dollars a month if U.S. efforts intensify on the scale demanded by many Congress. The wars are directly responsible for the flow of refugees out of the Middle East into Europe. Also, and this is huge, Obama wants you to “Get involved: Spread the word using #AidRefugees on social media.” Because nothing can help people without food, water and in need of medical care better than knowing suburban Americans and privileged college kids are putting up hashtags. Here, kid, eat this Tweet. “We have a moral responsibility to do what we can for families forced from their homes,” Obama said about the crowdfunding campaign, in a cheerleader-in-chief effort to get people to donate to the crisis. As of this writing the Kickstarter campaign has yielded about $1.2 million, about the cost one a couple of bombs dropped on Syria or Iraq during time you’ve spent reading this. Over four million people are registered refugees. So the Kickstarter money works out to about 25 cents per person, Here, kid, eat this quarter. Lame and sad as all that is, the lamest and saddest thing is not that the U.S. government wants us to pay for this like it was some new dot com startup, but that the U.S. government knows damn well that what the refugees need more than anything is something money can’t buy: a safe place to immigrate to. As of September 2015, the U.S. had only accepted 1,500 Syrian refugees. Feel good yet about that $20 you just put on your credit card over at Kickstarter yet? 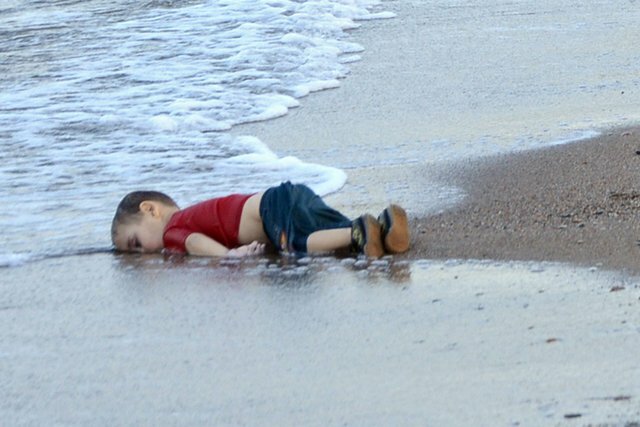 As the Middle East refugee crisis enters its fifth year, a single image of a child dead on a beach serves as its symbol. Yep, we’re gonna look at that kid again. But why is it that those that create refugees are the least likely to help them? The answer lies in empty rhetoric from those who begin America’s wars in the region under the guise of humanitarian intervention itself. A searing image of a refugee child lying dead on a beach finally alerted the world to a crisis now entering its fifth year. Awareness is never bad, but here it too easily bypasses the question of where all the refugees come from, in favor of a simpler meme. One is reminded of Malala, one story that pushes aside millions. Such narratives bait a familiar trap: the need to “do something.” That “something” in the Middle East is often the clumsy hand of military intervention under the thin cover of humanitarian rhetoric. Cries answered that way have a terrible history of exacerbating a problem they ostensibly set out to solve. The scope of the problem is staggering. According to the United Nations High Commission for Refugees, there are more than three million Syrian refugees in the Middle East. Inside Syria itself, over 17 million people are in need of humanitarian assistance, including those internally displaced. Only 350,000 Syrians are estimated to have traveled to Europe. They are the ones you see on television. The situation in Libya, Yemen, Afghanistan, Somalia and elsewhere is much the same. In 2003, President George W. Bush declared the goals of the United States in invading Iraq included freeing its people. In case that was not clear enough, in 2007 Bush proclaimed the American military the “greatest force for human liberation the world has ever known.” Yet by 2007 the number of displaced persons in Iraq had grown by some 50%. President Barack Obama used similar rhetoric in 2014, when he revived the United States’ war in Iraq in response to a “humanitarian crisis that could turn into a genocide” for the Yazidi people. 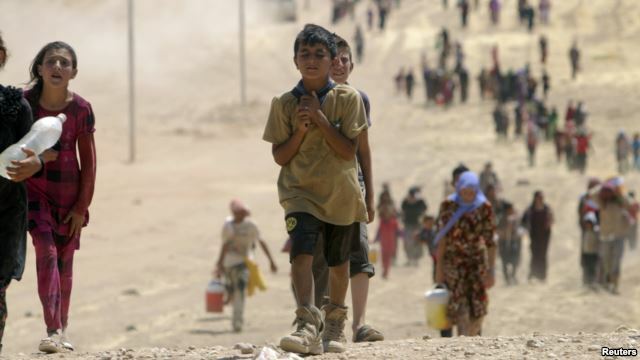 “One Iraqi cried that there is no one coming to help,” President Obama said at the time. “Well, today America is coming to help.” A senior administration official went on to explicitly describe the action as a humanitarian effort. 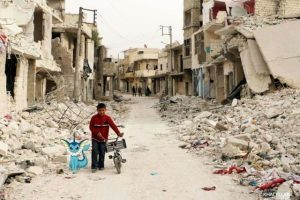 Some 5,000 airstrikes later, that humanitarian effort is now a bloody war with Islamic State, metastasized across multiple nations, exacerbating the refugee flow. For the Yazidis, long-forgotten by Americans as the no longer needed casus belli, the war enveloped them in Islamic State’s slave trade. After it appeared Assad used chemical weapons in 2013, it was American Secretary of State John Kerry who insisted that it was “not the time to be silent spectators to slaughter.” Airstrikes were forestalled for a time, then popped up in 2014 aimed not at Assad, but at Islamic State. Chaos has gone on to drawn numerous foreign powers into the conflict. With Libya in 2011, there was again a “humanitarian effort,” lead by then-Secretary of State Hillary Clinton. Clinton sold intervention as a necessity: “Imagine we were sitting here and Benghazi had been overrun, a city of 700,000 people, and tens of thousands of people had been slaughtered, hundreds of thousands had fled. The cries would be, ‘Why did the United States not do anything?’” That “doing something” helped push Libya into failed state status, feeding the refugee flow and bleeding conflict into neighboring countries. It is foolish to claim the United States alone “caused” all of these refugee flows; multiple factors, including the aggressiveness of Islamic State, are in play. But it would be equally foolish to ignore American culpability, directly in Iraq and in Libya, and via arms flows and the fanning of flames, in Syria and Yemen. The common element is a stated intent to make things better. The common result is the opposite. To many, particularly outside the United States, political rhetoric is just the aural garbage of imperialism. But inside the United States, military “humanitarian” intervention generally enjoys robust support. It may look like a shoddy product to some, but people continue to buy it, and thus it continues to happen. Politicians seem to know how to feed the public’s demands to “do something” triggered by an emotional photograph for their own purposes. There exists an inverse relationship between those that create refugees and those who help them. The United Nations High Commission for Refugees referred 15,000 Syrians to Washington for resettlement over the last four years; the United States accepted only 1,500, citing, among other issues, concerns over terrorists hiding among the groups. But that was then, pre-photo. Right on schedule following Kerry’s remarks, President Obama promised, per the New York Times headline, to “Increase Number of Syrian Refugees for U.S. Resettlement to 10,000.” With the problem seemingly solved, albeit only 10,000 out of millions, the plight of the refugees disappeared from America’s front pages. Left unsaid was the emptiness of even such non-military humanitarian rhetoric. President Obama did not mention, nor was he asked about, the reality that refugees to the U.S. are processed, not accepted. That processing can take years (the average out of Syria is two years at present), indefinite if enough information on a person’s security background cannot be amassed. If a positive “up” decision cannot be made that a person is “safe,” then the default is indefinite pending status. Such a conundrum has, for example, stymied the applications of many Iraqis and Afghanis who served as translators for the American military and fear for their lives, only to have been left behind. There also remain voices calling for another escalation of war in the Middle East to deal with the “root causes” of the refugee crisis, loosely defined for now as Islamic State’s continued existence. 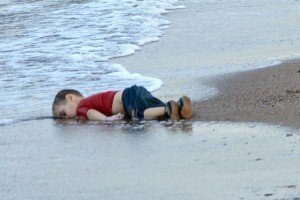 The world finally noticed that one Syrian refugee kid drowned on a beach, after failing to notice the Middle East refugee crisis has been an ongoing disaster for almost five years now. Same for the U.S.; Obama just announced he wants America to accept 10,000 Syrian refugees, so this is all fixed now, we can go back to Miley and Katy, right? No. Here was the state of affairs as of the day before Obama’s announcement. The United Nations High Commission for Refugees referred 15,000 Syrians to Washington for resettlement over the last four years; the United States accepted 1,500, with formally announced plans to take in only another 1,800 by next year, citing, among other issues, concerns over terrorists hiding among the groups. Many in Washington likely felt that was enough. A token increase, some nice, high-flying language, a little sprinkle of freedom and respect. I think we’re done here. Well, that’s good, right? I mean, the estimates are that there are some four million Syrian refugees already out there, with another 10 million internally displaced, so even if it is 10,000 that’s hardly anything but still, better than nothing. Maybe. But let’s dig down one level deeper. Refugees are processed, not accepted. That processing can take years, indefinite if enough information on a person’s security background cannot be amassed; there remains great fear in the U.S. government about terrorists sneaking into refugee flows, and so if a positive “up” decision cannot be made that a person is “safe,” then the default is indefinite pending status. Such a conundrum has, for example, stymied the applications of many Iraqis and Afghanis who served as translators for the American military and fear for their lives, only to have been stuck left behind. There are also medical and other checks before a refugee is approved. With all the variables, there is no average processing time, but post-9/11 we can say the average is s-l-o-w. In the world of suffering, slow can often mean death. It appears the White House is taking full advantage of the media’s ignorance of how refugee processing works to create the appearance of doing something when little of a practical nature is being done, all sizzle and no meat. There is little help coming from the United States for any significant number of Syrian refugees. Sorry guys! Victory! Most of World’s Refugees from US-Liberated Countries! January 12, 2012 // Comments Off on Victory! Most of World’s Refugees from US-Liberated Countries! The UN High Commission on Refugees (UNHCR) is proud to endorse the fantastic successes of the US efforts to free the people of Iraq and Afghanistan. After all, “we did get rid of Saddam” has become the rationale and justification of choice for America’s nine year war and occupation of Iraq. Afghan and Iraqi refugees accounted for almost half of all refugees under UNHCR’s responsibility worldwide; three out of ten refugees in the world were from Afghanistan (3 million). Afghans were located in 75 different asylum countries. Iraqis were the second largest refugee group, with 1.7 million people located primarily in neighbouring countries. 2010. The applications came mostly from Afghan and Somali children. And so, on behalf of all Americans, I say to those refugees simply this: You’re welcome! Good news for troubled times– the US is going to drop $6.5 billion keeping the World’s Largest Embassy (c), our palace along the Tigris River in Baghdad, warm and cozy. Plus, we’ll thrown in some refugee support! “We are standing up an embassy to carry out a $6.5 billion program, when you throw in the refugee programs as well as the actual State Department budget for 2012, of assistance in support for Iraq on a very broad variety of security and non-security issues,” US Ambassadorial tool James Jeffrey told reporterse. “It doesn’t come directly onto the Iraq account… but we get a very significant part of that here, and it’s used by other agencies and activities for example in Jordan and Syria,” home of sizeable Iraqi refugee communities. And for those still pondering who won the war in Iraq, it seems we now have a clue: US defense contractors. Iraqi living standards have two unusual characteristics. First, they have fallen over the past generation. Second, they feature surprisingly little inequality. These characteristics are both rooted in Iraq’s recent history of authoritarian government, war, military occupation, insurgency, and civil strife leading to infrastructure destruction and population displacement. There have been few opportunities for individuals to prosper from professional or entrepreneurial activities. Decades of neglected investment have resulted in deterioration of social services and economic infrastructure. Consequently, individuals have lacked capabilities to prosper and an investment climate conducive to prosperity. School enrollment and life expectancy have declined. Extremely low returns to education reflect the combination of poor educational quality and lack of employment opportunities. In terms of economic infrastructure, access to reliable electricity and water, and even access to paved roads are low, are further reflections of decades of neglect. And that my friends is the sound of freedom.